Innovation often arises from limitations, and Apple has certainly inspired plenty of innovation from iOS developers and accessory makers. Case in point: dealing with limited storage. On the iPhone, iPad, and iPod touch, you won’t find an SD card slot or USB port to connect more storage, as are found on many Android and Windows-based devices. Apple offers solid reasons for not including those options—multiple ports add complexity and the need for an exposed filesystem. But that’s no consolation when your 16 GB iPhone or iPad is full and requires the familiar synchronization dance that involves moving photos, videos, and other space hogs off the device to make room for more. As a workaround, accessory manufacturers have turned to Wi-Fi networking. Kingston’s MobileLite Wireless is primarily designed to stream media—videos, photos, and music—to your iOS device, but a couple of additional capabilities help it stand out from other similar products. One of the best characteristics about the MobileLite Wireless is Kingston’s focus on “Lite.” It’s roughly the same height and width as an iPhone 5s, but twice as thick, and weighs just 98 grams (0.2 pounds). There’s no internal hard drive to weigh it down, only a battery and circuitry. The key appeal is that storage is up to you: an SD card slot accommodates SD, SDHC, and SDXC cards, and an included adapter lets you pop in a microSD card. SD storage is now fairly inexpensive—32GB cards (which can hold several movies or thousands of photos) cost around $20, more if you want a faster card. Or, plug a USB thumb drive filled with media into the USB port. 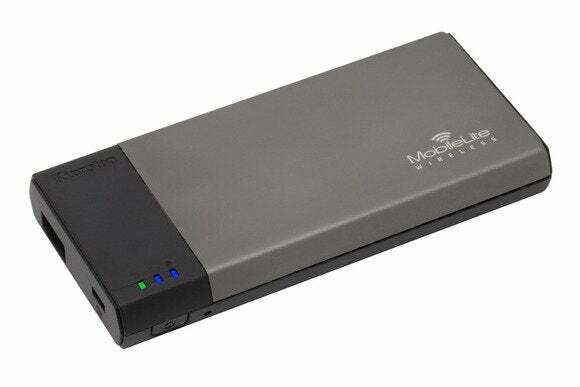 The MobileLite Wireless creates its own Wi-Fi network (initially unprotected but can be secured by specifying a WPA2 password later), to which you connect your iOS device. Using the free Kingston MobileLite iOS app, you can read and access the files. 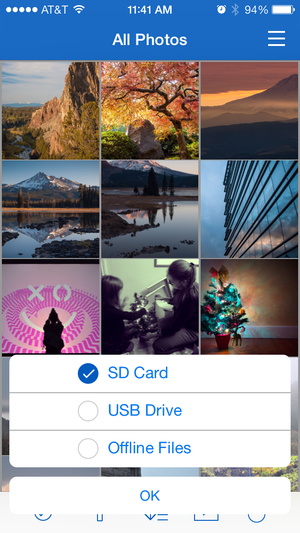 You can transfer photos and videos from an iOS device’s Camera Roll to an SD card or USB thumb drive connected to the MobileLite Wireless. Smartly, the MobileLite Wireless can also hop onto a nearby wireless network (such as a home network) so you don’t have to trade Internet access for media streaming. Once set, it remembers the password and joins the network automatically when it’s within range. What the accessory actually does with the files depends entirely on the formats iOS can natively read. All files appear in the Files pane, but not everything can be played or viewed. For example, videos formatted as M4V and MP4 can play; protected media, such as those purchased from the iTunes Store, will also play, but the MobileLite app hands them off to Safari for authentication and playback. Up to three devices at a time can stream separate content; in my testing, playing multiple videos didn’t pause or stutter. Some other file types, such as PDFs and Microsoft Word files, can be read. For anything else, you can use the Open In convention of iOS to pass the file to a different app. Data doesn’t flow in just one direction, however. You can transfer files from your iOS device to the MobileLite Wireless, but the capability is limited to photos and videos from the Camera Roll. This is great for freeing up space on your iOS device (make sure you remember to transfer the files to your computer at some point), although pushing a lot of image files can take a while over Wi-Fi. 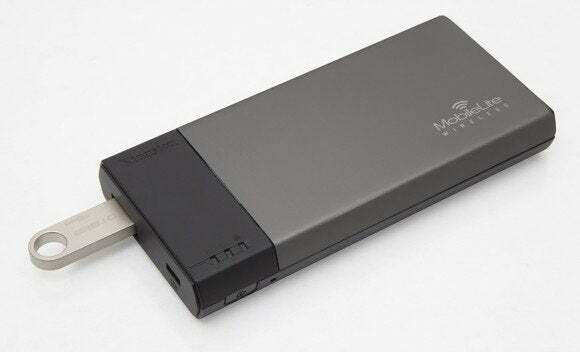 The last of the MobileLite Wireless tricks is “battery bank mode.” Since the unit already includes an 1810 mAh 3.8V battery to power the Wi-Fi radio, Kingston made it possible to charge a device via USB. Battery bank mode isn’t available while you’re accessing storage wirelessly, so don’t expect to charge your iPhone while streaming a movie. But it does help when the iPhone’s power is getting low. Movies that otherwise wouldn’t fit onto an iPad can be streamed from the MobileLite Wireless. Kingston’s MobileLite Wireless is an inexpensive way to access more storage than what comes with iOS devices. Letting you use SD cards and USB thumb drives of any capacity doesn’t lock you into a fixed amount of storage. And the battery bank mode is a bonus when you need a quick battery boost.